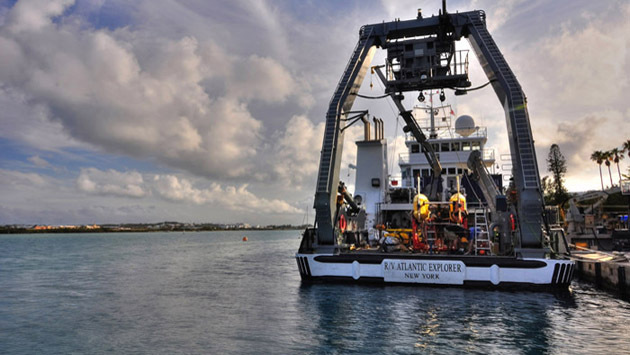 The Bermuda Atlantic Time-series Study (BATS) completed 24 years of continuous sampling of the water column to learn more about the ocean’s biological and chemical cycles and how they are impacted by climate change. As of 2012, more than 500 publications have been authored using data from BATS research. In the summer of 2012, the Coral Reef Ecology and Optics Lab (CREOL) completed a dedicated effort to map the reefs of the north shore of Bermuda to support future reef monitoring projects. CREOL also constructed an experimental flume that allows students and scientists to conduct research on coral health and ecology. Scientists in the Molecular Discovery Lab published data indicating that sea urchin cells are highly resistant to cancer causing agents, showing very little DNA damage and high survival rates at doses that kill human cells. After starting out at BIOS five years ago as a Waterstart student, Bermudian Kascia White interned in the Coral Reproduction, Growth, and Recruitment Lab during the summer of 2012 assessing the effects of climate change on coral larvae. She will graduate from St. Mary’s University in 2013 and is interested in returning to Bermuda to pursue a career as a marine science veterinarian. A group of teachers from the Bermuda Union of Teachers participated in a professional development workshop at BIOS that emphasized real-world connections between current scientific research topics and what’s being taught in science classrooms. Continuing to offer free educational resources and professional development for primary, middle, and secondary school teachers. We’ve accomplished so much in 2012. Help us to continue that work by supporting BIOS in 2013! Gifts of every size help make a difference in our ability to conduct meaningful ocean science research and education. Donate now!